July 26, 2017, 9:30 a.m.
By Ricardo Bilton @rbilton July 26, 2017, 9:30 a.m.
News organizations these days are spending a lot of time and energy making sure that data plays a central role in their newsrooms. But fewer are putting as much effort into building that kind of data culture into their organizations overall. That argument is core to the Data Culture Project, a new effort designed to help nonprofit organizations expand data literacy to more of their staff and leadership. While the program isn’t designed exclusively for journalism nonprofits, its creators are interested in seeing how, for example, data-literate reporters and editors can extend those skills to less technical people in other departments. The program’s activities, which focus on topics such as data storytelling, spreadsheet analysis, and test mining, are designed to be accessible, and assume no prior knowledge of how to work with data. “When we’re talking data culture in a journalism organization, we’re not just talking about data journalism,” said Catherine D’Ignazio, assistant professor of civic media and data visualization at Emerson College. “We’re talking about shifting the culture of the whole operation, including the people at the top, to understand how data can provide insight into all parts of an organization.” D’Ignazio is developing the project alongside Rahul Bhargava, a research scientist at MIT Center for Civic Media. The Data Culture Project was developed with the understanding that organizations face plenty of barriers to making data literacy more core to their organizations. One of the most common of these barriers is that, for the leadership at many organizations, data is seen as something solely in the purview of IT departments. And in other organizations, data is controlled by evaluation departments, which must collect data because of funding stipulations. 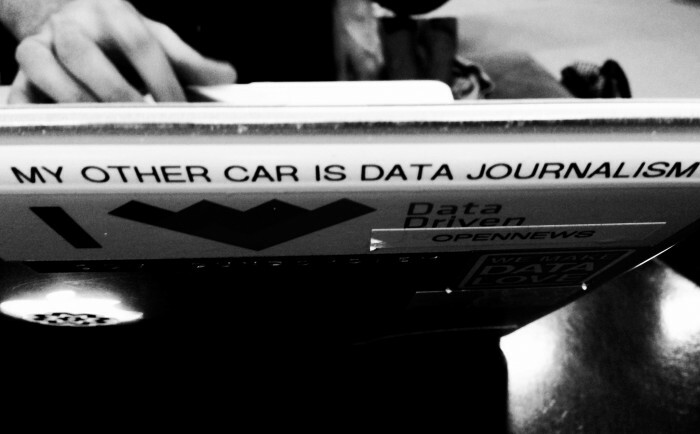 Photo of My Other Car Is Data Journalism sticker on a laptop by former Knight-Mozilla OpenNews fellow Mike Tigas used under a Creative Commons license. POSTED July 26, 2017, 9:30 a.m.
Bilton, Ricardo. "A new program wants to help more people in news orgs — beyond journalists — get literate with data." Nieman Journalism Lab. Nieman Foundation for Journalism at Harvard, 26 Jul. 2017. Web. 24 Apr. 2019. Bilton, Ricardo. "A new program wants to help more people in news orgs — beyond journalists — get literate with data." Nieman Journalism Lab. Last modified July 26, 2017. Accessed April 24, 2019. https://www.niemanlab.org/2017/07/a-new-program-wants-to-help-more-people-in-news-orgs-beyond-journalists-get-literate-with-data/.